Haley MeLampy assisting with GPS marking and staking of a proposed waterway. The Wisconsin Certified Crop Advisers Board of Directors sponsored a Crop Scout internship this summer. This internship, in its second year, was received by Haley MeLampy from Ann Arbor, Michigan. Haley is a college student studying Environmental Studies and Forest and Wildlife Ecology at the University of Wisconsin-Madison. Haley received crop scout training from several CCA members including Mike Bertram and UW Weed Science graduate student Dan Smith at the UW Arlington Agriculture Research Station and Carl Nachreiner of the Landmark Services Cooperative. Training focused on crop pest scouting, crop development staging, weed identification and other components such as agriculture safety and equipment operation. Haley also worked with the Great Lakes Bioenergy Research Center assisting in biofuel research at Arlington Ag Research Station as well as work in the WI Integrated Crop Rotation Systems Trial. 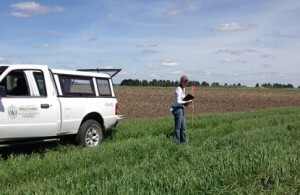 Other duties encompassed in the Certified Crop Adviser internship include chemical application for weed control, “Weed Garden” maintenance, forage moisture sampling and soil sampling. Haley also had the chance to compete on the UW Weeds Team in the North-Central Weeds Science Society’s Weed Contest held in Johnston, Iowa by DuPont Pioneer and DuPont Crop Protection this July. A very special thanks to the Wisconsin Certified Crop Advisers Board of Directors for sponsoring this internship. Future plans will continue to be discussed as the CCA Program supports the educational development and profession experience of new crop consultants entering the industry.